Best Evidence Rule - В сложной финансовой ситуации приходит на помощь кредит наличными в Казахстане. Except as otherwise provided by statute, an original writing, recording, or photograph is required in order to prove the contents of the writing, recording, or photograph. For example, in Sun Bank of St. Lucie County v. Oliver, 403 So.2d 583, 583-84 (Fla. 4th DCA 1981), a bookkeeper testified regarding her company’s deposit slips, books, and records without introducing such documents into evidence. 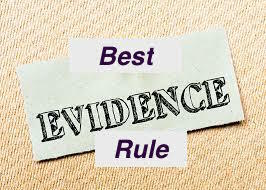 The appellate found that this testimony violated the best evidence rule: “The best evidence in the instant case would be the company records and only after their admission would Ms. Rogers’ [bookkeeper] testimony as to her findings be proper.”. In another example, T.D.W. v. State, 137 So.3d 574 (Fla. 4th DCA 2014), a detective described the contents of what she viewed on a surveillance videotape. The detective’s testimony was offered to prove the truth of the contents of the video. The video was not introduced at trial. The appellate court held the detective’s testimony violated the best evidence rule: “Typically, useful surveillance video shows the commission of a crime; when offered to prove the crime without introduction of the video in evidence, a witness’s in-court description of the actions depicted on the video is content-based testimony that violates the best evidence rule.” T.D.W., 137 So.3d at 576. But, in J.J. v. State, 170 So.3d 861 (Fla. 3d DCA 2015), the appellate court held that if a fact witness observed live events that were also recorded by video, the witness can describe the events even if the video is not admitted into evidence without violating the best evidence rule.